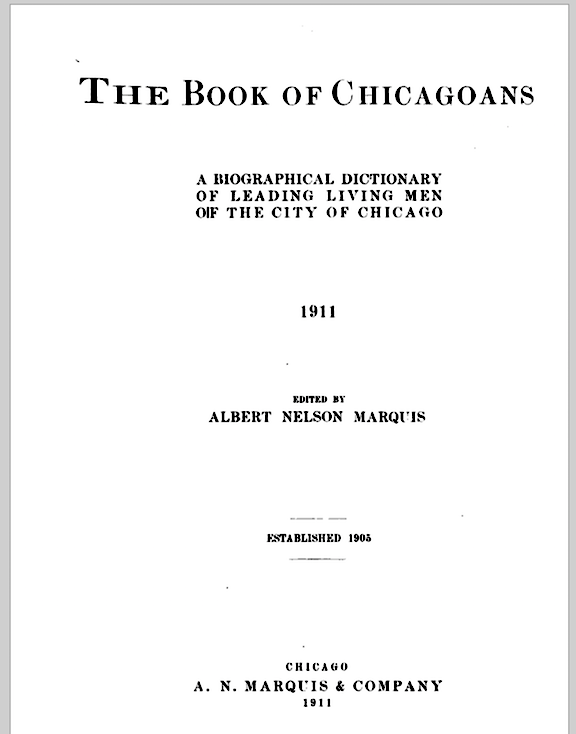 The Book of Chicagoans, Is a book which contains the names and biographical information provided by leading Chicago citizens. The book was published in 1905, 1911, and 1917 and is over 700 pages. We have extracted the names of individuals whom we believe to be Jewish. This was done by reviewing the biographies and extracted individuals who stated that they were Jewish or due to their Jewish affiliations with presumed Jewish organizations such as Temple Sinai, Ravisloe Country Clubs, or the Standard Club. The database contains the individual’s name and the complete text of the biography along with the page number in the 1911 book where it appears. The database can be searched by name or by using the “contains” in Notes-1 field to search for other family names or other references that appear in the detailed text of the biography. The current version of the Collection contains 197 records from the 1905 and 1911 editions. The 1917 version will be included at a later date. Book cover links to the online book for viewing actual entries. The Book of Chicagoans Collection project was created from an idea by Mike Karsen, JGSI Past President.